Congo’s constitutional court is poised to rule as early as Friday on a challenge filed by the election’s declared runner-up. Martin Fayulu has requested a recount, alleging fraud. Upholding the results could spark violence in a country hoping for its first peaceful, democratic transfer of power since independence in 1960. The AU statement said heads of state and government agreed to “urgently dispatch” a high-level delegation to Congo to find “a way out of the post-electoral crisis” in the vast Central African nation rich in the minerals key to smartphones and electric cars around the world. Congo faces the extraordinary situation of an election allegedly rigged in favor of the opposition. There was no immediate government comment. Fayulu accuses the administration of outgoing President Joseph Kabila of falsifying the results to declare opposition leader Felix Tshisekedi the winner after the ruling party candidate did poorly. Fayulu has cited figures compiled by the influential Catholic Church’s 40,000 election observers that found he won 61 percent of the vote. Two sets of leaked data show that Fayulu won the election by a landslide, according to an investigation published this week by Radio France International and other media working with the Congo Research Group. In the first set of data, attributed to Congo’s electoral commission and representing 86 percent of the votes, Fayulu won 59.4 percent while Tshisekedi received 19 percent. The second set of data, from the Catholic Church’s mission, represents 43 percent of the votes. In it, Tshisekedi and ruling party candidate Emmanuel Ramazani Shadary each received less than 20 percent. Fayulu, a lawmaker and businessman who is outspoken about cleaning up Congo’s sprawling corruption, is widely seen as posing more of a threat to Kabila, his allies and the vast wealth they have amassed. Tshisekedi, the son of charismatic opposition leader Etienne who died in 2017, is relatively untested and has said little since the Dec. 30 election. The AU statement was issued after Congo’s foreign minister and deputy prime minister briefed “a number of heads of state and government” from across the continent on the crisis. It said some of the heads of state would join the AU Commission chair, Moussa Faki Mahamat, in the urgent mission to Congo. Pressure from African nations is seen as having more of an impact on Congo’s government, which was annoyed by Western pressure during more than two years of turbulent election delays. The AU statement reflects serious concern by states about the threat of more unrest in Congo that could spill across borders and destabilize its many neighbors. But countries have wavered on how to address the crisis. The AU statement came hours after the 16-nation Southern African Development Community backed off its earlier demand for an election recount, instead urging the international community to respect Congo’s sovereignty. It stressed the need for stability in a country where conflicts over the past two decades have killed millions of people. The AU statement noted that SADC leaders attended the wider continental talks. 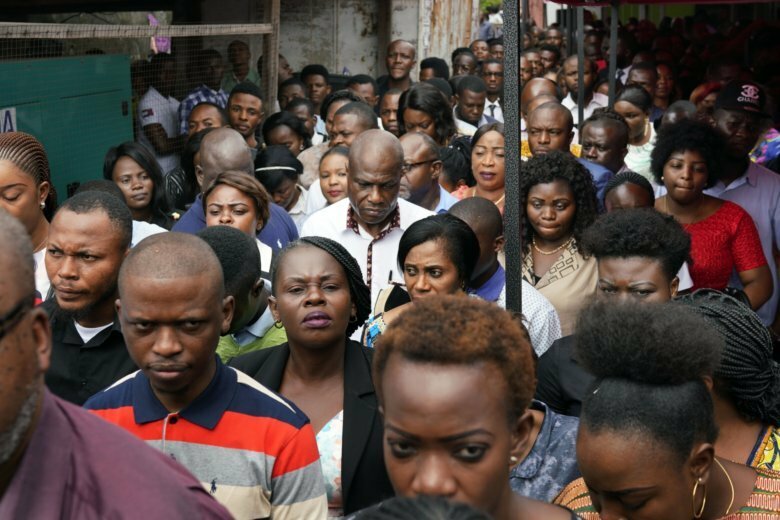 Congo’s election had been meant to take place in late 2016, and many Congolese worried that Kabila, in power since 2001, was seeking a way to stay in office. Barred from serving three consecutive terms, Kabila already has hinted he might run again in 2023. Election observers reported multiple problems, including the last-minute barring of some 1 million voters in the east, with the electoral commission blaming a deadly Ebola outbreak. That alone undermines the election’s credibility, some observers said. All of the election results, not just the presidential ones, have been widely questioned after Kabila’s ruling coalition won a majority in legislative and provincial votes while its presidential candidate finished a distant third.